The purpose of reading is comprehension — getting meaning from written text. Find out what else research tells us about the active process of constructing meaning, and how good readers consciously employing comprehension strategies. Without comprehension, reading is a frustrating, pointless exercise in word calling. It is no exaggeration to say that how well students develop the ability to comprehend what they read has a profound effect on their entire lives.1 A major goal of reading comprehension instruction, therefore, is to help students develop the knowledge, skills, and experiences they must have if they are to become competent and enthusiastic readers. Over the past few decades, research has revealed a great deal of information about how readers get meaning from what they read and about the kinds of instructional activities and procedures that are most successful in helping students to become good readers. For many years, reading instruction was based on a concept of reading as the application of a set of isolated skills such as identifying words, finding main ideas, identifying cause and effect relationships, comparing and contrasting and sequencing. Comprehension was viewed as the mastery of these skills. One important classroom study conducted during the 1970s found that typical comprehension instruction followed what the study called a mentioning, practicing, and assessing procedure. That is, teachers mentioned a specific skill that students were to apply, had students practice the skill by completing workbook pages, then assessed them to find out if they could use the skill correctly.2 Such instruction did little to help students learn how or when to use the skills, nor was it ever established that this particular set of skills enabled comprehension. At about this time, a group of psychologists, linguists, and computer scientists began to focus research attention on how the mind works — how people think and learn. A goal of this new research movement, called cognitive science, was to produce an applied science of learning. While cognitive science research was producing valuable information about comprehension processes, reading education researchers were reporting important findings about what comprehension instruction looks like in the most effective reading classrooms. The convergence of these strands of research has provided a wealth of information about what good readers do as they read, about how good and poor readers differ, and about the kind of instruction that is needed to help students to become good readers. What do good readers do as they read? One way that researchers have studied what good readers do, has been to ask them to think aloud as they read. From these studies, researchers have determined that the seemingly effortless activity described as "good reading" is made up of a set of highly complex, well-developed, and well-practiced skills and abilities. Before reading, good readers tend to set goals for their reading. They note the structure, or organization of the text, and often create a mental overview or outline of the text to help them decide whether it is relevant to their goals. During reading, good readers read words accurately and quickly, and simultaneously deal with the meanings of those words — as well as the meanings of the phrases and sentences into which the words are grouped. Good readers connect the meaning of one sentence to the meaning of another. If something is confusing to them, they use their background knowledge to try to clarify the meanings of words and phrases. Sometimes good readers interact with the text by asking themselves questions about its content and reflecting on its ideas. Good readers are selective as they read. They are likely to focus more of their attention on the parts of the text that are most closely tied to their reading goals. They may decide to skip some parts of a text because they already understand the content or because they do not think the parts are important to what they need (or want) to learn from the text. They may decide, after reading several pages, to skip the rest of a chapter because they recently read something similar. On the other hand, they may decide — either because they do not clearly understand the content or because they find the topic interesting — to reread a passage or chapter before going on. They also may summarize the content of a passage as they read it. In doing so, they may consciously determine what is important, what is supportive, and what is less important. As they read, good readers often make inferences. They may draw on their background knowledge or look for clues in the text to supply information about characters or events that the author has not provided directly. Some good readers may also create mental images, or visualize a setting, event, or character to help them understand a passage in a text. After reading, good readers often think about, or reflect on what they read. They may mentally summarize major points or events in the text, or even go to other sources to find additional information about the topic of the reading. In short, good readers are most often strategic readers. 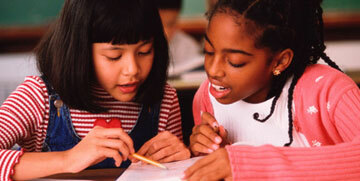 That is, they use a number of comprehension strategies to get meaning from text. Comprehension strategies are conscious plans or procedures that are under the control of a reader, who makes decisions about which strategies to use and when to use them. In addition, good readers engage in metacognition as they read. Cognition refers to mental functions such as remembering, focusing attention, and processing information. Metacognition refers to people's awareness of their cognition; that is, their thoughts about their own thinking.11 From an array of possibilities, for example, readers with metacognitive awareness are able consciously and automatically to select the appropriate comprehension strategies for use with a particular text. How do poor readers differ from good readers? All too often poor readers lack sufficient background knowledge about the topic of a text. They may have trouble connecting the ideas of a text. They often are not familiar with the vocabulary they encounter, and have trouble determining word meanings. Further, even when poor readers possess relevant background knowledge, they frequently are not able to activate it to help them understand what they read. Some poor readers also are unaware of text organization. They do not know enough about the organizational structure of narratives or the various organizational structures of expository texts to help them read and understand. After reading, poor readers typically do not think about or reflect upon what they have read. They almost never seek out additional information about a topic. 1. Anderson, R.C., Hiebert, E.H., Scott, J.A., & Wilkinson, I.A.G. (1985). Becoming a nation of readers: The report of the Commission on Reading. Washington, DC: The National Institute of Education. 2. Durkin, D. (1978-1979). What classroom observations reveal about reading comprehension instruction. Reading Research Quarterly, 15, 481-533. 3. Dole, J. A., Duffy, G. G., Roehler, L. R., & Pearson, P. D. (1991). Moving from the old to the new: Research on reading comprehension instruction. Review of Educational Research, 61, 239-264. 4. Heilman, A. W., Blair, T. R., & Rupley, W. R. (1998). Principles and practices of teaching reading. Upper Saddle River, NJ: Merrill/Prentice-Hall. 5 Baker, L., & Brown, A.L. (1984). Metacognitive skills in reading. In P.D. Pearson (Ed. ), Handbook of reading research (pp. 353-394). New York: Longman; Paris, S.G., Wasik, B.A., & Turner, J. C. (1991). The development of strategic readers. In R. Barr, M.L. Kamil, P. Mosenthal, & P.D. Pearson (Eds. ), Handbook of Reading Research (Vol. 2, 609-640). New York: Longman. 6 Dole et al., 1991. 7 Pressley, M., & Afflerbach, P. (1995). Verbal protocols of reading: The nature of constructively responsive reading. Hillsdale NJ: Lawrence Erlbaum Associates. 8 Paris, S. C., Wasik, B. A., & Turner, J. C. (1991). The development of strategic readers. In R. Barr, M. L. Kamil, P. B. Mosenthal, & P. D. Pearson (Eds. ), Handbook of reading research (Vol. 2, pp. 609-640). New York: Longman. 9 Paris, S.G., Lipson, M.Y., & Wixson, K.K. (1983). Becoming a strategic reader. Contemporary Educational Psychology, 8, 293-316. 10 Palincsar, A. S., & Brown, A. L. (1984). Reciprocal teaching of comprehension-fostering and comprehensionmonitoring activities. Cognition & Instruction, 2, 117-175. 11 Palincsar & Brown, 1984. 12 Pressley & Afflerbach, 1995. 13 Adams, M. J. (1990). Beginning to read: Thinking and learning about print. Cambridge MA: MIT Press. 14 Cunningham, A. E., & Stanovich, K. E. (1998). What reading does for the mind. American Educator, 22, 8-15. Texas Educational Agency. (2002). Comprehension Instruction, 4-8. Retrieved from http://www.netxv.net/pm_attach/67/TRI-Comprehension_Instr.pdf. Your materials are very helpful in my own learning and in the teaching of my students. Thank ever so much.